How Andrew Bent became so skilled at the printing craft has long remained a mystery. In a memoir of Bent published in the Mercury in 1881 James Erskine Calder asserted that Bent had been apprenticed to the Times newspaper at a very young age. The source of this information (along with an incorrect birth year) appears to have been Andrew Bent junior. Bent’s own statements corroborate the early start but reveal very little about where he learnt his trade. He never claimed, or even accidentally revealed, any direct association with the Times and we, like earlier researcher Basil Cronly, have been unable to either prove or disprove that he was ever apprenticed there. It is possible that Bent’s family (or indeed Bent himself in what he told them) laid a false trail about his London background. While we have found nothing to confirm his association with the Times, we have found fragmentary scraps of evidence of his connection to another London newspaper, the Public Ledger, which was printed by John Crowder in Warwick Square. Pieced together, these are convincing. Further, it would appear that Bent kept in touch with the Ledger for at least a decade after his arrival in Van Diemen’s Land, and that it influenced the path his own paper took. A cryptic reference in 1829 by probable boyhood acquaintance John Pascoe Fawkner suggests that Bent may even have been with Crowder in some capacity prior to Fawkner’s departure with his family on the Calcutta early in 1803. Fawkner described Bent as the “errand boy” at the Public Ledger Office in Warwick Square. Bent’s apprenticeship indenture has not so far come to light. His name does not appear in the records of the Stationers’ Company at any time up to 1810, nor among the eight apprentices taken on by John Crowder through the Playing Card Makers’ Company between 1789 and 1801. John Walter, printer of the Times, although himself a member of the Stationers’ Company, operated completely outside it in taking on apprentices (with a notable exception in 1810 when his journeymen went on strike) and John Crowder after 1801 may have behaved in similar fashion. It is possible that Bent was apprenticed as a poor child of the parish of Saint Giles in the Fields. Indentures for his younger brothers Benjamin and Richard, from 1804 and 1811 respectively, have been found in the St. Giles parish records at London Metropolitan Archives. Unfortunately no indentures have survived for the years 1800-1802 when Andrew would have been between nine and twelve years old. However, while pauper apprenticeships were generally made at a young age (Benjamin was only nine and Richard eleven) they were usually conventional live-in arrangements and Bent’s habit of frequenting the Sugar Loaf public house in Saint Giles suggests that he may have been among a growing pool of “outdoor” printing apprentices. Bent may have begun in Crowder’s employ as an errand boy, or perhaps a “fly boy” who removed each wet sheet from the press as it was printed. His later abilities as a printer indicate he also received some well-supervised training as a compositor. As was the custom for apprentices, he would have begun by setting the advertisements. Bent was a tiny man, so would hardly have had the physical strength to have been a pressman in the days of the old double-pull wooden presses. The entrance to Warwick Square in 1827. Engraving after T H Shepherd. Wellcome Collection. During Bent’s time tiny Warwick Square (accessed from Warwick Lane) would have been abuzz with activity relating to printing and publishing. It was in close proximity to the book publishing hub of Paternoster Row. Also nearby were Stationers’ Hall, the London Coffee House, Newgate Market, the ancient Oxford Arms public house and Saint Paul’s Cathedral. Crowder’s printing office was at number 12 on the south-west corner of the square. 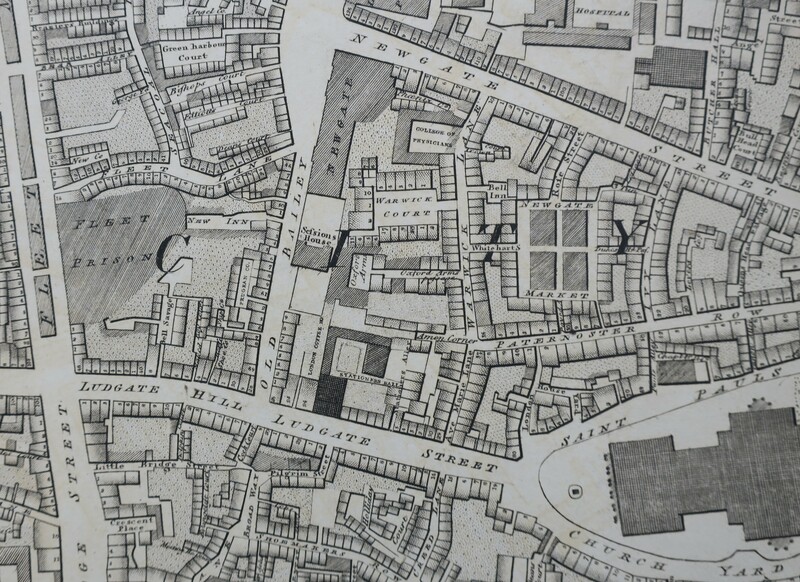 According to Horwood’s map from the 1790s, in which the square is named Warwick Court, it was the largest building in it, and was directly behind the Old Bailey Sessions House and just along from the looming bulk of Newgate prison. This map shows a narrow lane adjacent to the printing office leading directly through to the Sessions House. Two other newspaper printing offices were in Warwick Square at this time. John Wheble, at number 18, was printer of two newspapers distributed to the counties and also of the Sporting Magazine. He had early associations with radicals such as John Wilkes and Horne Took, but later became, like Crowder, a respectable member of the Court of Common Council, the lower of the two elected bodies governing the City of London. At number 23 (not shown on Horwood’s map) was the printing office of John Herriot Hart who from 1806 printed the ultra-radical and sometimes muckraking weekly the Independent Whig. In 1808 Hart and the Whig’s outspoken editor Henry White were each sentenced to three years’ imprisonment for a number of seditious libels. This newspaper, full of bombast about the importance of a free press, had some rather shady connections with the London underworld of moneylenders and blackmailers. Bent may well have associated with the Whig’s compositors and read its articles. During the period 1800-1810 a number of other businesses associated with newspaper distribution and advertising, book and print selling, book-binding etc. operated out of Warwick Square. There were also some general traders and two attorneys. In one of the curious coincidences which permeate Bent’s story one of the attorneys, Thomas Wylde, emigrated to New South Wales in 1815 when his son John was appointed Deputy Judge Advocate in Sydney. In 1810 Crowder was printer of three newspapers – the Public Ledger (a daily morning paper), the London Packet (evenings, three times a week) and the Mirror of the Times (weekly). In 1799, not long before Bent may have started there, Crowder registered eight printing presses, so his establishment was a sizeable one. The Public Ledger commenced in 1760 as The Public Ledger, or, the Daily Register of Commerce and Intelligence. It was primarily an advertising paper and according to Stanley Morrison was “designed to promote the interests of those buyers and sellers of all sorts of articles who were inscribed in the membership of an institution entitled ‘Public Register’ in St Paul’s Church Yard. John Feltham’s Picture of London (1802) described it as “merely a commercial paper, principally for shipping business” which aimed “at no circulation except among people in trade.” In 1810 it was priced at 6d. Over half of each four-page issue consisted of advertisements although the inner pages also supplied general news, family notices etc. Articles of intelligence and advertisements were received at Lloyd’s Coffee House. Although the paper’s motto “Open to all parties, influenced by none” had been on the masthead since its inception, it was known to have received money from the Pitt government in the 1780s and 1790s. Later Crowder appears to have worked strenuously to avoid party spirit. In 1828 the Tasmanian newspaper in Hobart commented that although Crowder “some few years ago adopted Whig Policy … the Ledger never was violent, and was as respectably conducted as any similarly established Journal could by possibility be. [sic]” Bent used the Ledger’s motto to head up the correspondence columns of his Colonial Times in 1826. During Bent’s time there the Ledger was conducted as a joint stock company. In 1828 Bent revealed he was familiar with its business model and considered applying it to his own newspaper in Hobart. Bent always saw his newspapers as important in disseminating commercial information and facilitating the growth of trade and the economy generally. This may well have been informed by the Ledger’s role as a paper representing commercial interests. And Bent’s own conduct and aspirations as a newspaper publisher may have been influenced by the successful career of that most interesting man, John Crowder. This portrait of John Crowder in his Mayoral robes by Sir William Charles Ross hangs in the Guildhall in London. Crowder was born in Buckinghamshire in 1756. He began his working life as a printer and journeyman compositor (and as Bent opined in 1837 there was nothing to be ashamed of in that). Crowder became a successful businessman and by the time of his death in 1830 had risen to be Lord Mayor of London. He first joined the Ledger in about 1780, after a stint with King’s Printer William Strahan. At this time the Ledger was printed and part-owned by Francis Blyth. Crowder married Blyth’s niece Mary Annabella James in February 1788 and after Blyth died the following June took over the printing business which was then located in Queens Head Alley, Paternoster Row. Over the course of his long career he also printed numerous books and pamphlets on a wide variety of subjects for various publishers. Crowder’s obituary in the Gentleman’s Magazine held him up as an exemplar to young men in business. His character could be “comprised in two words, INDUSTRY and INTEGRITY. Both distinguished him while in trade, and both he carried with him into public life.” He had carried on the paper for upwards of thirty years “with the greatest impartiality, diligence, and integrity.” He had also amassed a considerable fortune through successful speculations. Of “an amiable and generous temper”, his involvement in public life began with his election, in 1800, to the Common Council for the ward of Farringdon Within. Crowder relinquished the newspaper in June 1821, stating that during the long period in which it had been under his control he had “endeavoured, as much as possible, to make the general tone … accord with the liberal spirit of its Motto; shunning the vortex of Party on the one hand, nor seeking the favour of those in power on the other.” He admitted it was difficult to steer a middle course, and adverted, guardedly, to recent circumstances which, without his control, had “somewhat altered the tone of this Paper.” He may have been referring to the impact on newspapers of the repressive “six acts” which had been passed following the Peterloo massacre in 1819. Crowder was a London City Alderman from 1823 until his death in 1830, Sheriff in 1825-1826 (when his attendance at executions often had an overpowering effect on his feelings) and Lord Mayor of London 1829-30. He was also prominent in the Stationers’ Company late in life becoming Warden in 1828-9 and, while Lord Mayor, its Master. Despite Crowder’s charitable disposition and obvious status and influence there is no formal record of his interceding on Bent’s behalf after the burglary conviction. The Newgate authorities obviously knew Bent had been Crowder’s “boy” so it is possible he exerted some influence behind the scenes. While Bent’s workmates probably visited him in nearby Newgate, providing him with food and other little comforts, we simply do not know whether Crowder extended a helping hand or what attitude he took towards his errant apprentice. Bent obviously kept in touch with the Ledger and possibly others in Warwick Square. He set up a direct exchange of newspapers with Crowder’s printing office. The Ledger also printed a number of excerpts, some quite amusing, from private letters sent from Hobart Town. Although there is no definite proof, these were most likely written by Bent. The earliest, and one of the most striking, was a letter dated 23 September 1815. This was about the bush-ranger crisis and appeared in the Ledger on 9 May 1816. Bent appears to have enclosed a copy of Lieutenant Governor Davey’s proclamation of martial law as reprinted by himself in September 1815. The proclamation was sent to Lord Bathurst with Davey’s dispatch of 30 September and other recently printed enclosures per Jefferson whaler. The Ledger printed the entire text of the proclamation. Other newspapers covered the story more briefly over the next couple of days and had obviously copied it from the Ledger. It is not impossible that Davey was behind this communication, hoping for some favorable publicity in the English press. Alternatively, Bent may have simply written to his old workmates to let them know he was starting to do quite well, and related some of the interesting events in the still remote settlement. For Bent, as well as Davey, the opportunity offered by a rare vessel about to return to England was too good to miss. Similar letters from 1819 comment on improvements taking place in the colony and the price of commodities; on how “many of the prisoners, still under the sentence of the law, have lands and cattle; and a great many have houses, in Hobart Town” and how “several accomplished pickpockets, who made a conspicuous figure in London, may be daily seen driving of Cattle, making bricks, and in other laborious employments.” In 1823 letters reproduced in the Ledger document the growth in shipping, the cultivation of tobacco, the establishment of an Agricultural Society, the arrival of convict John MacDougall “of ship sinking notoriety,” the convict system, Governor Brisbane, public buildings and, once again, prices. Another letter, written late in 1823, notes the high esteem in which Lieutenant Governor Sorell was held, and expresses some trepidation about the arrival of his replacement, George Arthur. Bent had been one of the signatories to the petition for a public meeting to ask that Sorell might be allowed to stay on. The letter above suggests that correspondence came in the other direction too. This is borne out by a most interesting letter which appeared in the Colonial Times on 7 January 1831, by which time that paper was printed by Henry Melville. The letter was precipitated by recent developments regarding press freedom in France. It was carefully anonymous and details of the London journal to which it referred were omitted. But Bent’s own annotations in his file copy of this newspaper clearly indicate that he was the correspondent, and that he had remained in contact with the editor of the Public Ledger, a man named N. (or possibly R.) Calder, until at least a couple of years after Calder and Crowder both resigned. Calder (a man about whom we have been able to discover absolutely nothing) was much more forthright about their reasons for quitting than Crowder was publicly at the time. This letter, indirectly quoting from the French revolutionary anthem via an Irish song, was probably written in 1823 (not 1822 as Bent states) and may have arrived at a critical juncture in Bent’s thinking about the course he wished to adopt for his own paper under changing and challenging colonial circumstances. I need not tell you the alteration this has made in the system of conducting my paper. It of course breathes a pure spirit of independence; but while it protects the rights, the liberties, and the happiness of the human race, it will at the same time promote the views of the Colonial Government, without entering into any political or religious controversy. Before too much longer, with Bent lingering in a prison cell convicted of criminal libels published against Arthur, such hopes and optimism were entirely dashed. I feel like you, we will never know exactly as to whether he was trained as a printer, but he had the talent to be able to do the job.